You are currently browsing the category archive for the ‘Snacks’ category. 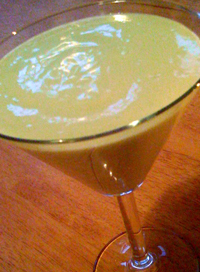 I know that I already posted a bunch of avocado smoothies, but this one is more like a dessert. Well, and I love avocado. 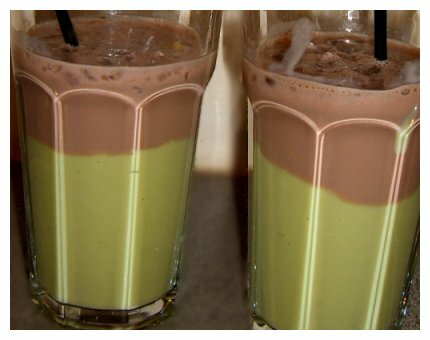 I think, avocado makes a fie milk substitute for any smoothie, as long as you put a small cup of water for every small avocado added. Oh,and this new smoothie is absolutely gorgeous. I adapted it from here. 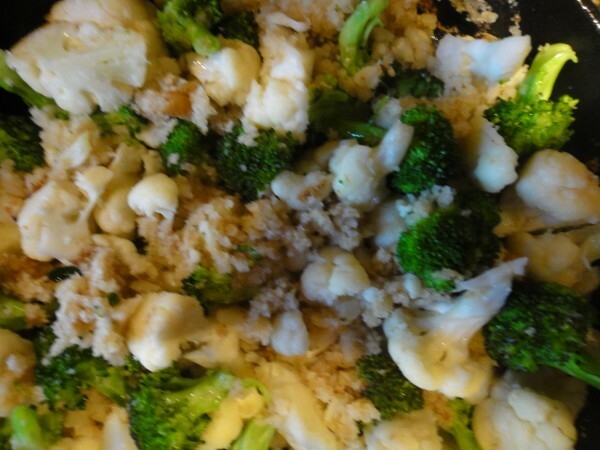 This recipe does contain vegetables, but overall is not so healthy. However, it is a-delicious and b-can make stubborn kids eat veggies. My mother used to make it when I was a kid and I have yet to meet a person who didn’t like it. Butter makes it taste great, but coconut oil is a pretty yummy healthier option. Olive or other vegetable oil doesn’t work here. Gluten-free breadcrumbs are a good option. I also like to add broccoli florets to this dish. It turned really yummy and the yield was 2-3 servings. Next time, I will try this interesting smoothie. What else can I do with zucchinis? I tripled the bean spread recipe and we had the leftovers for lunch today. The babies had the spread with some celery sticks and avocado chunks and we had baked potatoes with bean spread, avocado , kale and chives. Heat a bit of olive oil and water in a frying pan. Add a small garlic clove, minced, stirring a minute until fragrant. Add 1-2 tbsp. of Bragg’s amino acid sauce. Toss in a couple handfuls of kale (stems removed, chopped). Sautee until wilted. Add a few drops of tobasco, if desired. Place a generous dollop of warmed white bean spread over two pieces of toast. Top with cooked kale. Squeeze a splash of lemon over everything and put a slice of lemon on top (optional). I also put a tomato slice on top. Since we have three little kids, it’s hard to go out in the evening. So, I learned to make some gourmet foods at home. Flatbread is one of those foods. The best part about this recipe ( taken from here) is that the bread is easy to make and is gluten-free. Then, you can put whatever you want on top and tell the kids it’s pizza. 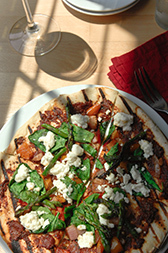 I like bell peppers, sundried tomato spread, portobello mushrooms, chunks of tofu, onions, tomatoes, zucchinis to top my flatbread…I sometimes put a bit of goat cheese on top and sometimes I forego the cheese altogether and the dish still tastes amazing. The recipe here is a suggestion. Make the basic flatbread and put whatever you want on top. After the bread is made, don’t forget to top it off with arugula leaves, some salt and olive oil. I also like to quintuple this recipe and freeze the unused portions in ziploc bags. Whenever I need dinner, I thaw some flatbread dough, roll it out and put something on top. Then I bake the flatbread for 10-20 minutes and dinner is ready! Preheat oven to 200 Celsius (400 F). Mix the salt, psyllium husk and flour together, add the water gradually so that it resembles a thick porridge, wait for a couple of minutes and then spread the batter on to a baking tray lined with baking paper. Spread the pesto sauce on top of the flatbread and put all of the veggies on top of the sauce.sprinkle some goat cheese over the veggies and bake at 425 degrees F for 10-15minutes. Take out of the oven and generously put arugula leaves on top. Put salt and pepper to taste. I know, the name spells: “The Weirdest Cake On The Internet,” but it tastes awesome! I found this delicious raw cake recipe about a month ago and never found time to make it. Too bad, because it only took me 30minutes today! If you like lemon flavor, feel free to also add a few drops of lemon extract. The original recipe asked for jicama. I used something simpler and more readily available. Mix all ingredients well. Separate into two halves. Take the first half and form in a shape of a cake. Beat/Whip the coconut oil with beaters! Whip again and add the agave. Then, add the lemon juice. Top the first layer of the cake with Frosting. Form the second half of the dough into another layer on a separate plate. Flip the plate to place another layer on top of the frosting.Frost the whole cake: top and sides. 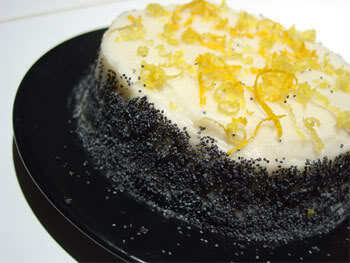 Sprinkle Poppy Seeds on the sides and maybe on top, as well. Top with Lemon zest curls or slices. Refrigerate for an hour or more. Serve at room temperature. Fourth of July will be here very soon. 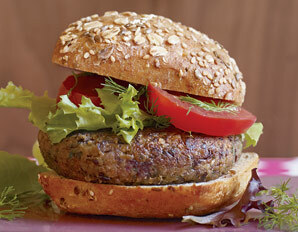 Before you start feeling bad for vegetarians, I have a really awesome bean burger recipe to share. It’s is vegan, gluten-free and soy-free. I found this recipe in Vegetarian Times magazine and changed a thing or two. The original recipe asked for quinoa, but I felt that buckwheat, while similar in texture, has a more “meaty” look to it. That, and I had some leftover buckwheat laying around. Enjoy! Preheat the oven to 350°F. In a medium frying pan, sautee the onions, the tomatoes and the carrots for about 4 minutes, mixing periodically. Use the oil form the tomatoes to sautee. Add the beans, the spices and the water. Simmer for about 5 minutes, or until most of the liquid has evaporated. Transfer the mixture to the food processor, add the buckwheat and process until smooth. Add salt and pepper. Oil up the baking sheet. Form 8 patties, using your hands. Arrange the patties in the baking sheet. Bake for 20 minutes, or until the patties are crisp on top. Flip the patties and bake for another 10 minutes, until both sides are crisp and brown. Serve in a whole wheat bun with lettuce and tomato. Mayonnaise, ketchup and cheese are optional. 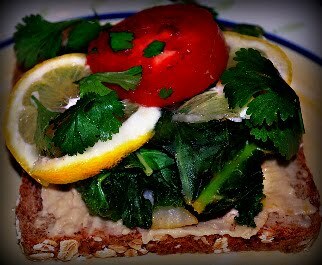 Hummus is a chickpea-sesame dip that works really well on a sandwich or with veggies. 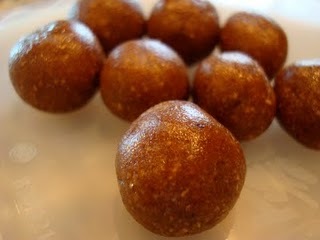 It is also a good source of vegetarian protein and fiber. It is rich in monounsaturated fat, if made with olive oil. 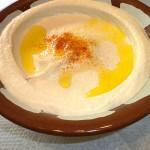 Hummus also contains calcium, iron, magnesium, phosphorus, potassium, and a few other trace minerals. 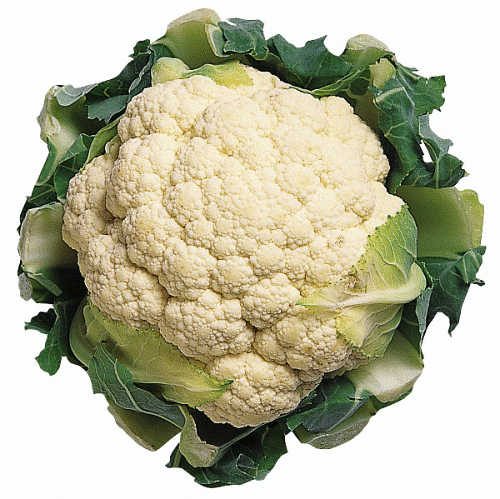 It contains a little of the B vitamins, including a good amount of folic acid and a little vitamin A. Most people buy hummus in the store and get a bunch of preservatives and artificial ingredients with their chickpea dip. I make my hummus myself, since I spent quite a few years in Israel, where hummus is eaten every day and the standards for hummus are quite high. Very few recipes are as easy as the homemade hummus one. My hummus can be fed to babies, because its protein will help them grow and all of its ingredients are completely natural. Older children love dipping veggie sticks and crackers into the hummus. You can cook your chickpeas or use canned ones, if pressed for time. You can add things to hummus to keep the dip new and exciting every day: adding whole chickpeas to the finished hummus gives it an interesting texture, cilantro or parsley or chives or garlic or even curry or paprika or pesto sauce change its flavor. Mashed carrots or sweet potatoes add sweetness, while avocado makes it more subtle-tasting. You can even be as adventurous as I am sometimes, making this hummus into a completely different dish altogether, using white beans, instead of chickpeas. Process everything in a blender until smooth and taste. Some people like their hummus to have a more pronounced sesame flavor (add tahini) and some want its consistency to be more liquid ( add 1/4 cup warm water.) Add the spices I mentioned above if you feel like it and serve on a plate with some more olive oil, poured on top (but not mixed in.) You can also serve it with a pinch of paprika on top. Hummus can stay fresh in the fridge for about 4 days.